The founders of 24/7 Learning Academy decided to create a high school personalized learning program designed around the premise that learning should never be limited by the hour on a clock or standard curricula. To accomplish our mission of making education relevant and available to all students with a burning passion to launch their own startup or a desire to attend a high school for leadership development, we put a technology-rich spin on the old one-room school house concept. Our blended-learning model is a high school with project-based learning, rather than centered around traditional grade levels and standardized testing. Mastery-based, student-driving learning objectives guide advancement and skill-based grouping. This ensures a rigorous educational experience that delivers 21st-century skill development focused on entrepreneurship, leadership and social justice. What sets 24/7 Learning Academy apart from a Montessori High School or a traditional private high school in Orlando, Florida is our team approach that includes live online sessions, in-person classes and 1:1 tutoring opportunities with intelligent software. Students experience collaborative and self-guided project assignments and explore personal learning styles, aptitudes and interest. And, we work closely with the community, so all students have access to mentors, specialists, college and career counselors and advisors to help them every step of the way. There are no boring lectures. Instead, Socratic discussions drive home important information and key concepts. Our educational programming is based on two key factors: 1) every student has unique learning styles and, 2) no two students have identical educational goals and passions. The educational journey should reflect a personalized curriculum that supports comprehension, skills development and access to internships, community service projects, apprenticeships and entrepreneurial opportunities designed to fuel his or her own passion. 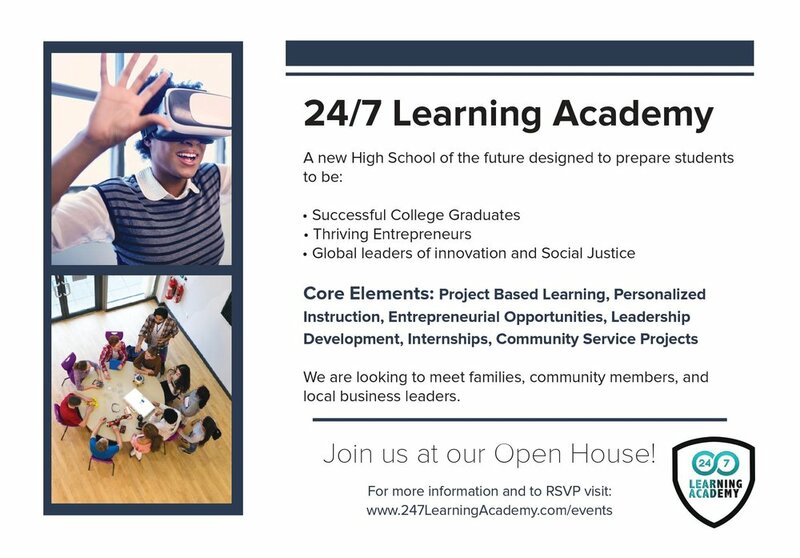 The 24/7 Learning Academy is a high school for entrepreneurship with additional training around Finance, Law and Advocacy, Culinary Arts and Media Production, Health and Wellness and Agriculture and Alternative Energy because we want each student who leaves the Academy to be fully prepared to enter college or a career. And, we do all this with remote and on-site programs and flexible schedules so students can participate on their own schedule. Multi-Discipline project-based learning ensures students understand why the content in their personal education plan is relevant, and how they can apply skills acquired to achieve their career objectives and enhance daily life beyond the classroom. We look forward to working with students and parents in our local communities and are pleased to announce our new school opening soon in Orlando. Please accept our invitation to visit an open house to learn more.